Last cycling day of the trip. Unfortunately the 101 Pacific Coast Highway was for the first time not directly at the coast, but separated by the sand dunes. 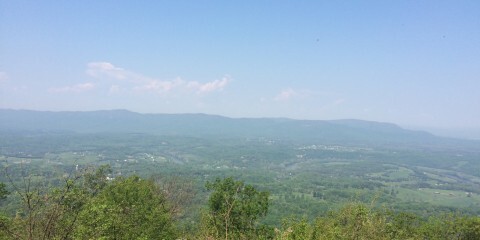 Anyways it was still quite hilly so that we had several overlooks during the day. 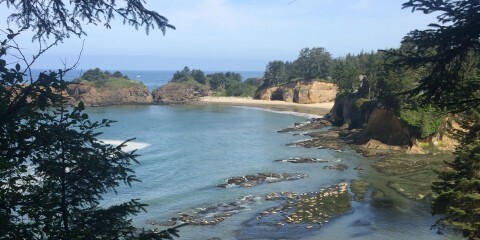 In the afternoon we entered the area of north bend which was ugly and not at the coast, so we decided to ride on to Sunset Bay State Park Campground which is located next to the sea. We spent the evening at the beach preparing chocolate fondue and waiting for the sun to go down. Restday in Florence. In the morning we went to the lake to waterski with Jerry. Sabine tried it and with the third attempt she got out of the water. 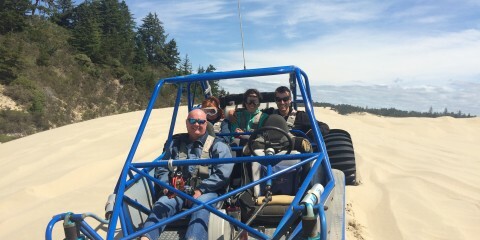 Around noon we explored the scenic Dunes of Florence American Style: Sitting in a 170 PS car and racing across the dunes for half an hour! Then Chris showed us an nice Lunch place with very good Hawaiian Food and drove us to the botanical garden in order to see some insect eating plants. 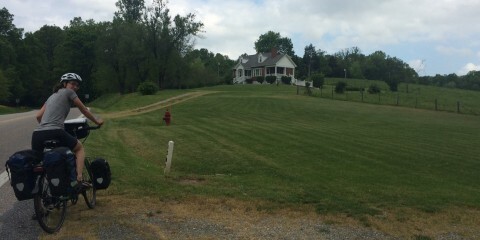 In the evening a bunch of other cyclist will stay at Chris house. Tomorrow is already our last cycling day! A little rain in the morning. We were riding along the coast with a lot of stops. First one at Seal Rock to see the rocks with the mussels in the intertidal zone. Second one in Yachats port for lunch and delicious Hippie Bread made by a Rastafari. Third stop at the Sea Lion Cave. In the evening we arrived at our Warmshower host Chris. And once more we realised that we grew up in a very stable environment compared to those crazy hosts on warmshowers originally from California! Second restday in Newport. 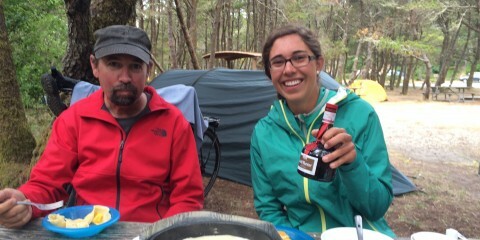 We started with Crepes flambee in the morning and invited Steven from Idaho. 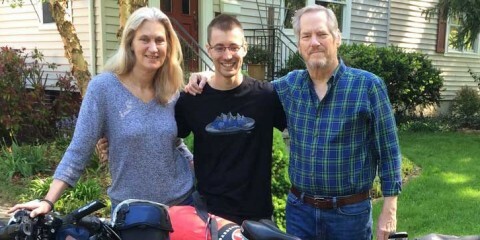 We wished Hans from Munich safe travels for the rest of his around the world trip. In the afternoon we went to the Beach, but the water is much cooler than in Seaside. In the evening we had local Seafood: Shrimp Burger and Fish and Chips. 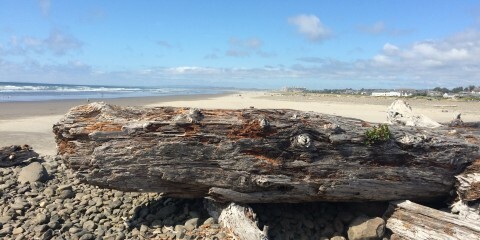 Restday in Newport at the South Beach state park. In the moring we started with two hours Disc Golf. We had lunch in the very busy Chowder Restaurant. In the afternoon we went to the library to replan the rest of the trip: Ride to North Bend along the coast, rent a car and drive to Crater Lake, Bend and Seattle. Now we plan to go to the beach and in the evening we will grill some fish on the campfire. Short 55 km ride along the coast. We saw grey whales in Depoe Bay and had a very good Donut next to the smallest harbor in the world. At Yaquina Lighthouse we saw seals and seabirds but unfortunately we missed the Tufted Puffins. In Newport we enjoyed the Cafe Mundo with european style bread! 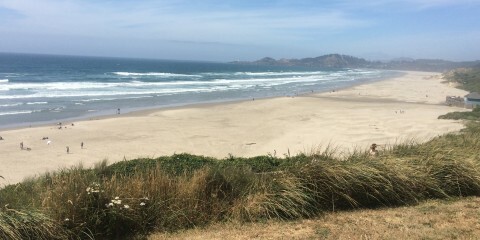 We stayed at another good Oregon coast camping site. We started at 6 AM and there was no condensation water on the inside of the tent! 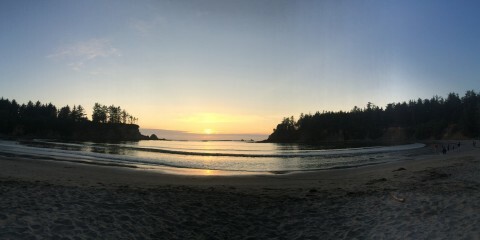 Another reason that the Best Camping Award goes to Oregon Coast! Anyway, despite everthing is nice and easy we feel mentally exhausted as we achieved our goal! Therefore we decided to take it easier and rode only in the morning 70 km along scenic coast with great outlooks and enjoyed the afternoon on the Beach. Without wind it was 30 C but with wind chill it felt like 15 C. In the evening I started eating Seafood after 10 weeks of only standard american options: Steak, Burger and Salads. 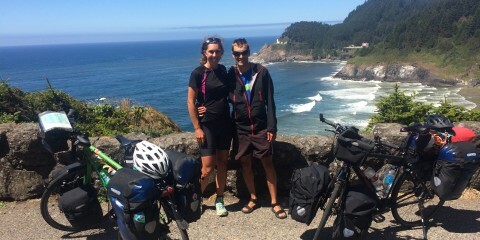 We started by saying good bye to the Lewis and Clark statue in Seaside and starting riding south the Oregon coast on the Pacific Coast Trail. It is very nice to ride on highway 101 on rolling hills along the coast as elevation is max 250 m. In addition there are a lot of lookouts with information tables. And Camping was the best ever! As it is right next to the beach in the shade of a forrest, no mosquitos, hot showers, cheap and only full for cars but never full for cyclist! Thanks Oregon! Restday where we enjoyed that we could stay at a house right next to the coast for free! Gran Marnier flambéed orange pancakes for Breakfast (until the Firealarm went off..) Said Goodbye to Daniel and Dries and planned the rest of the trip, where we are going down the coast to the Redwoods in California and back with the car over Crater Lake, Bend to Seattle. In the afternoon we were enjoying the Beach! Sand, Good weather and few people: Perfect! In the morning we followed Highway 30 to the mouth of the Columbia River. 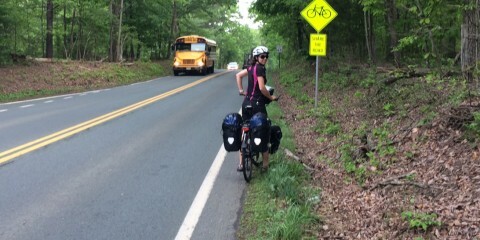 The ride was hilly, not flat as expected and it had a lot of traffic, arrival time in Astoria was 2 PM. Astoria is the official end of the TransAm and we expected more of the town than just Fish&Chips! Anyways, our Goal was the Ocean in Seaside and in addition Daniel and Dries were already waiting there! As expected the wind was coming from the North and blew us along the coast. 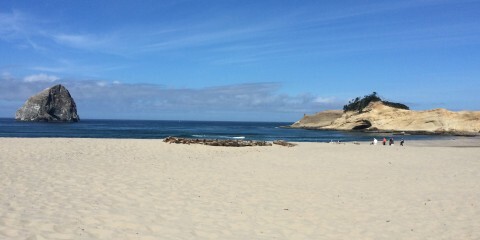 Upon arrival, I took a short Bath in the Pacific, before we were going to a famous Warmshower host! The host was not even there but 5 other cyclists! In the evening we enjoyed the Photoshooting at the Beach with Dries and Daniel, watched the sunset in the Pacific and had Beer&Bicycling stories in the evening! Felt like vacation! We started with a fantastic breakfast from our host Michael: Blackberry pancakes! 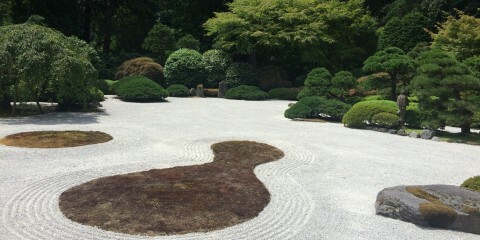 At 11 AM we rode to the Japanese Garden in Portland and found an oasis which really calmed us down. 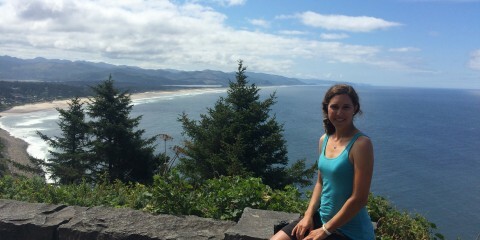 At 2PM we started actually riding on the Skyline Drive out of Portland. It was mostly in the forrest but anyways hot and humid, so that we felt like in the appalachiens again. 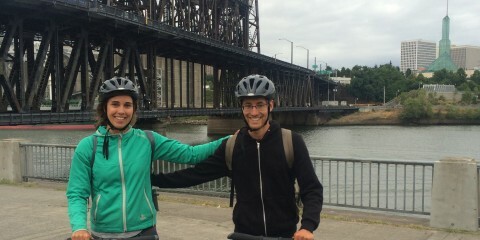 In the afternoon we rode down to the Columbia river and rode in the opposite direction of the 200 miles race Seattle – Portland of 10’000 amateurs. As we were not advancing very far and had a meeting the next day on the coast we decided for the first time to have dinner and ride on afterwards. 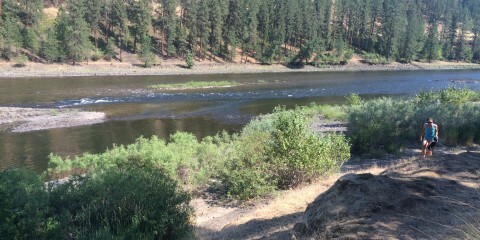 In mostly flat area with occasional small hills we rode next to the river until 9 PM to Rainier right before sunset. Restday in Portland. Farmers Market near the University with good local food for lunch. Walking to the Science Musuem on the other side of the river and feel like little kids again by doing experiments. In the afternoon we did a Segway History Tour cruising around the city. In the evening we had dinner and drinks with Michael our warmshowers.org host! At midnight we walked 3 km back to his home which was kind of a alternative history tour of Portland! 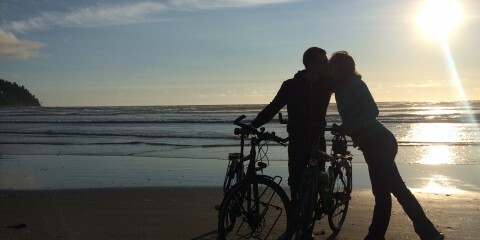 As we planned only a 80 km ride to Portland in mild temperatures we slept 2h longer until 5:30. In addition there was only a weak headwind, but nonetheless we advanced slowly as we were still exhausted from the previous days. The landscape changed from the golden wheat fields to a green forrest. 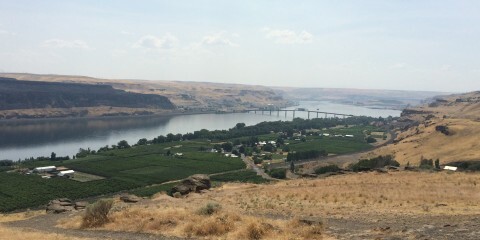 We climbed a small hill and enjoyed a great view on the Columbia river. 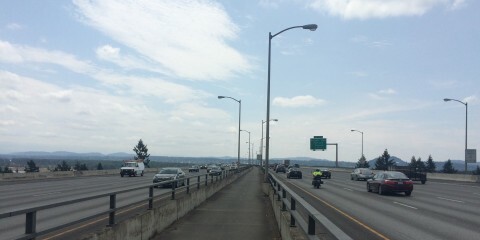 In the afternoon we entered portland in the middle of two four lane highways! Anyways there were really good bike lanes to enter the city! Tonight we stay at a warmshower place (www.warmshowers.org) and tomorrow will do some sightseeing! Still exhausted from yesterdays long and hot ride, we started with a steep climb. At least we had a wonderful outlook over the Columbia River. Afterwards we hit the long expected headwind for around 50 km near Hood River, which is apparently well known by surfers. 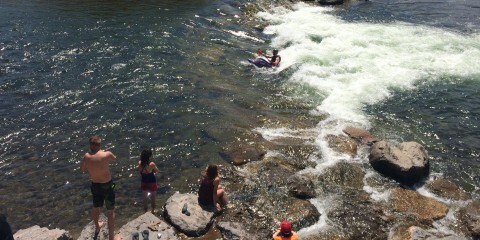 We enjoyed having lunch and watching the surfers on the river. The positive side of the wind was a mild temperature of 30 C compared to yesterday. However, again a very long day riding! In general we are now in a more and more touristic area with really good food, but only expensive motels available! 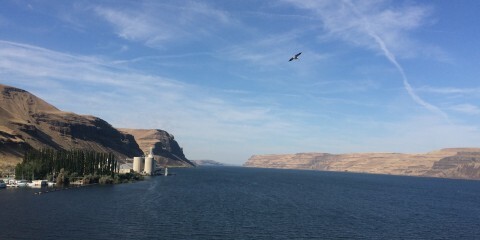 We started in Umatilla (Oregon) but were riding in the Evergreen state Washington all day next to the Columbia River. The first 80 km until lunch at 10am were easy as it was under 25 C and only a weak wind. After the lunch break and a bath in the river we bought fresh cool water, but it did not last long. After 120km at 2pm we felt lucky that there was no headwind despite so man windfarms along the way! But without wind it got unbearable hot: the air temperature was around 40 C but the last two hours climbing slowly uphill our velocomputers displayed temperatures around 45 C. A second bath in the cool river felt like life saving before the last 5 km uphill which were the toughest on the tour so far. Finally, after 135 km at 3 PM we were so happy to find one of our first fruit stands were we were eating fresh, sweet & cold Peaches in the shade! 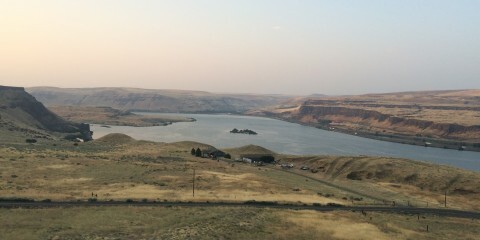 Started again in the first daylight at 4:30am and we were surprised that it was only 22 C. We made good progress in the morning until we came close to the Columbia River. There was a very strong headwind which slowed us down dramatically and we were afraid that this would be the normal wind strength which we were warned by other ciclysts. But after 10 km we actually rode along the Columbia River and the wind suddenly stopped. The Columbia River is really impressive and reminded us more of a lake than a river and we took a first bath in it at 10am and second in the afternoon in the beautiful Marina of Umatilla. In addition, we saw a lot of Pelicans! 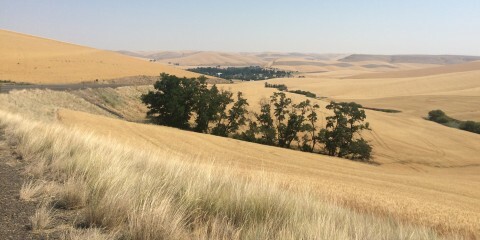 Started from Pomeroy with the first sunlight in the morning riding through golden wheat fields. At 9am we had our second breakfast at the Dayton at Rays restaurant. In the picture, Waitsburg looks like an oasis in the golden wheat fields. Before Walla Walla we had more climbs than expected and we enjoyed the drinking water which was around 30 C. However, it took us until midday to escape the heat (38 C) and having a siesta in a Travellodge Motel. After the Independence day party yesterday we slept in until 5am this morning. 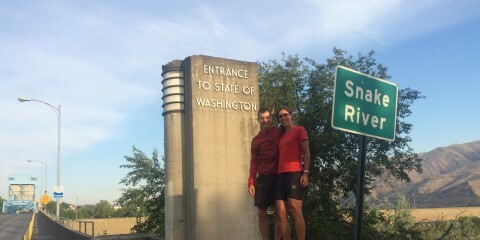 First we entered the state of Washington in the sister city of Lewiston: Clarkston. We followed the Snake river for a bit and after some days of only downhill rides we had again a 600m climb. On top we were happy to met another cyclist, as they have become rarer on the Lewis and Clark Trail compared to the TransAm. After only 55km in Pommeroy we escaped the heat in the nice and cheap Pioneer Motel. In the afternoon we had Siesta and planned the coming days. We will be in Portland on the 10th of July and in Astoria on the 13th of July. 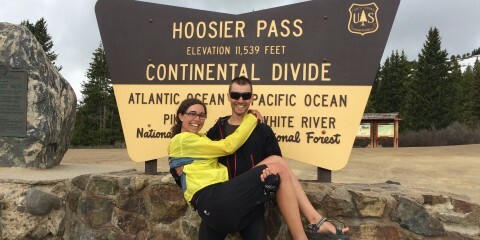 Then we plan to ride down the Pacific Coast into the south to California for ten days! Another day in the heat! 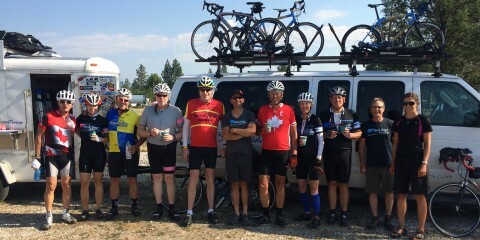 Starting early and until 9am we have 50km and had a break in Orofino. We changed our route and instead of the TransAm we are following now the Lewis and Clark Trail to the Pacific Coast. Main reason is to save some hills and time for the Coast of California! 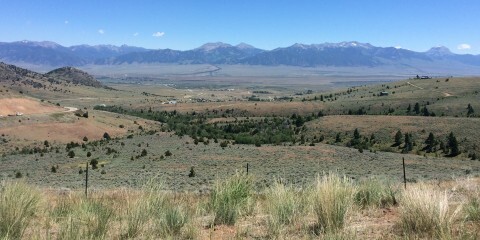 In addition the heat is already cruel but in th desert of oregon or uphill we imagine it unbearable. Anyways, today we completed our first 5000km and we are expecting some fireworks tonight! Independence Day: The Land of the free because of the Brave! We started again early in the morning as we are in a heat wave since two days and for the next weeks. This means that from 11am until 9pm it is more than 30 degrees Celsius and for several hours in the afternoon it is around 40 C! Today we have measured the temperature on the surface of the bicycle 47 C. Until the afternoon we rode the first 100 km only downhill along the river in the cool morning. But as there was no motel with AC (Air Conditioner) we decided to continue to ride on in the oven. It was only possible as there was a river just next to the street an we jumped in ever 7 km to cool down. With cool drinks and Ice Cream we managed to do another 50 km along the river where we stayed on a KoA Campground in Kamiah. As usual we got up early at 4:30am and could leave Missoula before the morning traffic at 5:30am. The 700m climb to Lolo Pass was easy and completed at 11am as we climbed steadily over 50km. On top we entered Idaho and the pacific time zone. There was a nice Visitor center which showed a documentary about the Lewis and Clark Expedition. In the afternoon it was too hot to continue cycling. Instesd we built a small pool in the river at Powell. In the evening we had dinner at the Lochsa Lodge Restaurant with Greg and Audrey. Restday in Missoula. Doubletree is a very nice hotel as we had breakfast with a view on the river. There was a lunch concert in the center of the city and just next to it is a surf place in the river. To the relaxed atmosphere contributes that a lot of people are floating down the river on pneus. 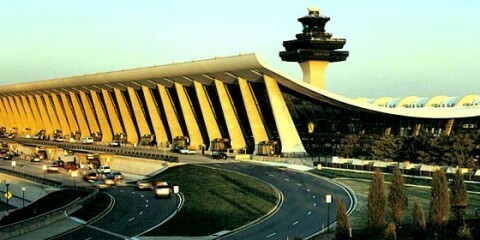 One of the very few places where we could imagine to live in the US so far. 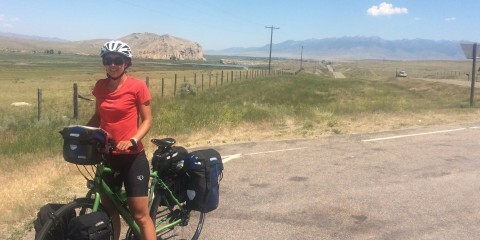 As we made good progress over the last few days, only 80 flat km left to Missoula! As usual we got up early to avoid the heat and after one hour of riding the Black Bear Adventure Cycling Team caught us. Big surprise for us at the first stop, as they decided to invite us for one night at the Hilton associated Doubletree Hotel in Missoula! Thank you! There was an easy riding until Lolo on a newly created Bicycle path, but the last 10 km into town was a bit of a pain. 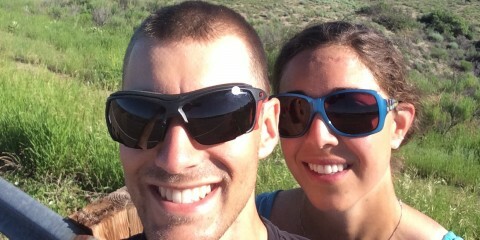 In Missoula we were visiting the TransAm Headquarters and planned our last route: We will follow the Louis and Clark Trail to Astoria and then going along the pacific coast ending the cycling in Crescent City. Missoula is a very nice town and it was very hot so we took a bath in the river which reminded us of Rhine swimming of our home town! 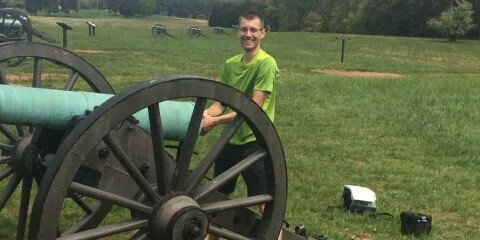 In the morning we visited the Big Whole Battlefield where it was exactly described how the US Army attacked and killed Nez Perce Indian men, women and children, because they did not agree to move to another Indian Reservation, but choose to flee 2000 km towards the Canadien border: Sad! However, the King Joseph Pass was easy in the morning and then the best Downhill route of the whole route: we were loosing over 1000m in elevation and it got much warmer. In Darby we needed Ice Cream to cool down and once again we met the Black Bear Adventure Cycling Team. 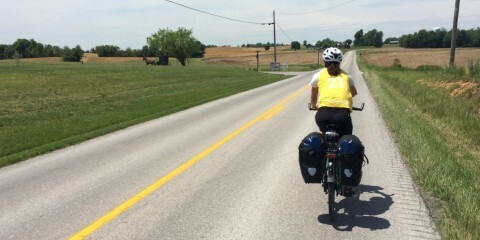 The last miles to Hamilton were starting to get hot and ugly. 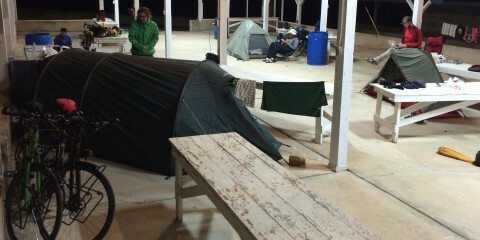 To avoid the 36 C in a tent we choose to take a Motel. This time with a AC but incompetent personal. 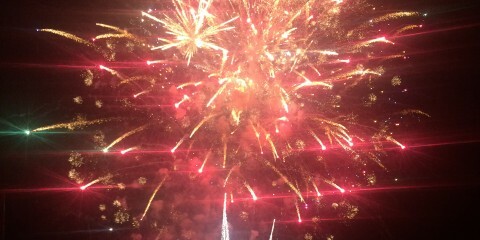 10 minutes after checkin they requested the address of the swiss embassy and my “Dampfkochchopf” suddenly exploded! In order to avoid the heat we started at 7:30am – Badger Pass and Big whole Pass were waiting. After one hour of riding we were surpassed by the Black Bear Cyclist group again which had the same route as us. As we arrived on top of the Badger Pass we were lucky to find the the Black Bear Group still there and inviting us again and we had watermelon and almond milk. The next pass was much harder as the temperature was rising again over 34 degrees. Anyways we were lucky to find the shadow of a haystack machine on top of Big whole Pass. After lunch we met a british couple which was looking forward to the hot springs of Jackson, but we were prefering a cold shower in Wisdom. In wisdom we were invited by Kevin to Barbecue in the Backyard as there was no room left in his motel. We stayed in the last room available of the village and were happy to have escaped the nastiest mosquitos so far! However we did not escape the heat as the room had no AC and until 11pm it was 30 degrees in the room! Today we got up at 4am in order to see the stars, but it was already too late. In Twin bridges we met first Andreas (DE) going east with 25 year old Transam maps. Shortly afterwards we met Jim from Oregon and we agreed to share the campground in the evening. 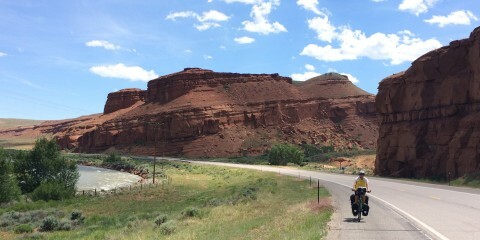 The ride was flat but incredible hot (36 C) and there was no shadow all around Beaverhead Rock. 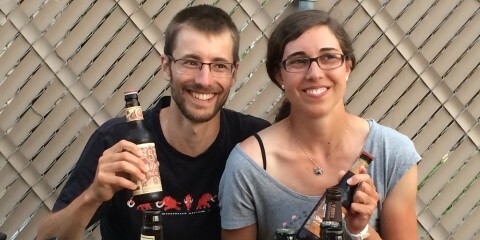 With the exception of a support car of the Black Bear Adventure Cycling Team. And unbelievable, the team saw us coming and Bob invited us. So we sat in the shadow and got a very good salad and a cold Drink! Fantastic! 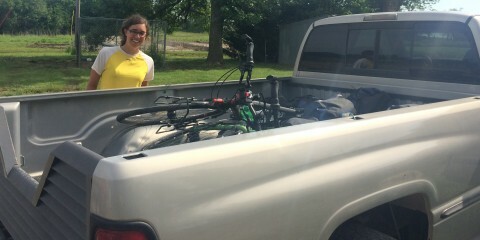 Thank you, that helped us very much to ride through the heat to Dillon. In the evening we stayed on the KoA and had the best conversation on the trip with Jim so that we even forgot to go to the concert of the Cancer Bycicle Race in Dillon. In the morning we started with a nice 50 km downhill ride with tailwind along the madison river, which is going into the atlantic ocean. We had early lunch in Ennis in a nice old restaurant called “Yesterdays” before a 600m uphill part at 32 degrees in full sunlight. But the dry air at 2000m elevation feels so much cooler and makes it much easier. Nearly at the top we met a older swiss couple, which is traveling the US since 25 years and apparently still enjoing it (au wenn dr Verkehr zuegnoh het). In the afternoon we enjoyed Ice Cream at Virginia City, a museum like city from the gold rush in Montana. In the afternoon downhill ride we saw the impressive landscape of a former gold digging area, where 100 years ago machines digged their way through the river leaving behind huge piles of stone. Apparently it was worth it, as they found gold worth nowadays 2 billion. In the evening we found a nice and cheap campground with Wifi and a store in Alder. Last day in Yellowstone National Park we saw a Bald Eagle (Weisskopfseeadler). In the morning we entered the state of Montana in West Yellowstone, which is a nice little town but to expensive to stay overnight. We had lunch at Hebgen Lake and learned more about the Earthquake Lake which was created in 1959 during a 7.5 earthquake and a subsequent hang slide into the madison river. In the evening we stayed at a very nice campground at West Fork in Madison county in apparently the best fly fishing area of the US, as a lot of guys from California are coming here for more than 40 years. 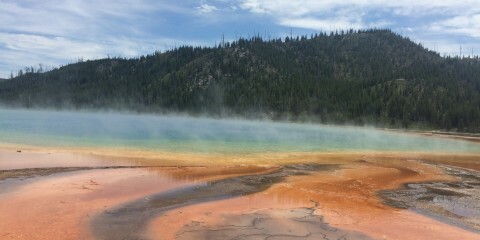 Today we had a guided tour around Yellowstone. 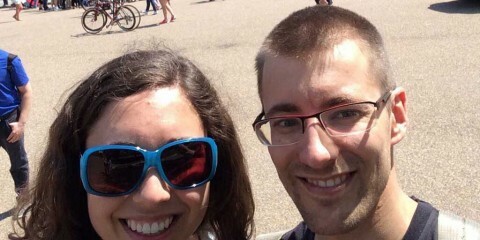 Experience Nature american style, but we were happy to see a bison next to the street from inside a car. 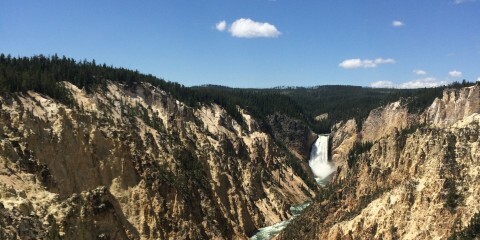 Yellowstone Grand Canyon and the geysir Old Faithful are very beautiful, but there were way too many tourists. 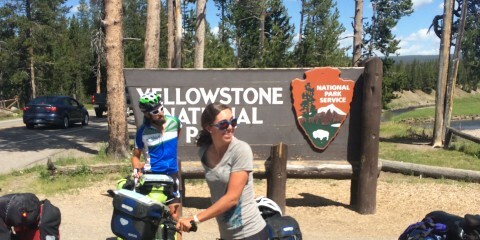 Today we left the Teton National Park after two rest days and were riding to Yellowstone Nationalpark with three other cyclist we have met before. The hard shoulder (a hardened strip alongside a motorway for stopping on in an emergency) is not broad anymore and there is way more traffic. So we decided to explore more of the park in a guided tour with a car tomorrow. Restday 2 in Grand Teton National Park. 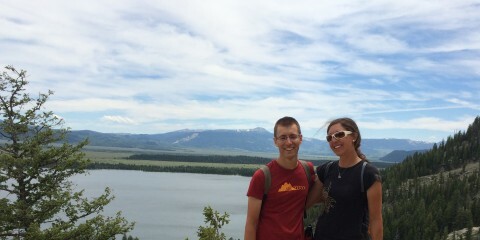 Hiking between Jenny Lake and Grand Teton. In the evening we had a Bison Steak on the Campfire where we were joined by four fellow cyclists. 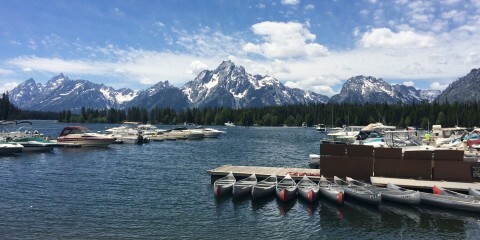 Restday in the Grand Teton Nationalpark. In the afternoon we went fishing on the Jackson Lake and caught five sea trouts despite the hard water. In the evening we prepared them on the campfire and could only eat three as they were too big. Two we gave to a group of geology students from Texas and in return we got some Tamales. 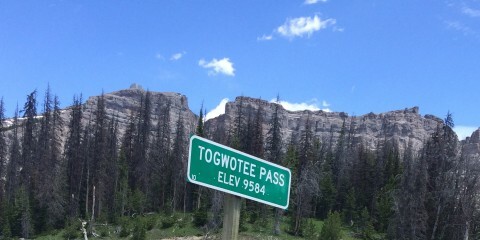 Today was though, in the morning mosquitos and a 1000m climb for 50km to Togwotee pass. In the afternoon 40 km/h headwind for the supposedly easy downhill ride. Anyways the view on the Grand Teton was fantastic. 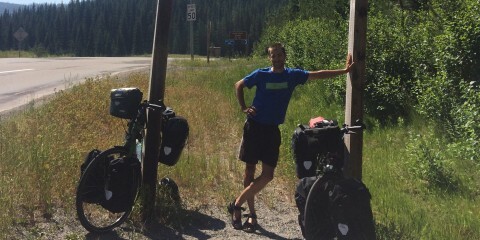 We met also a lot of Mountain bikers which are following the Great Divide Trail. 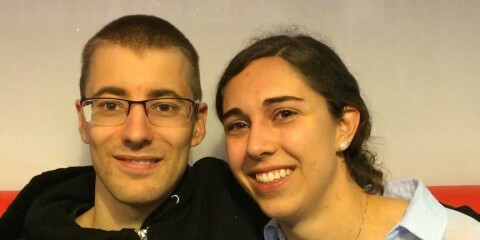 In the evening we had dinner with the first Swiss we met on the tour and we enjoyed to talk Swiss German with Felix. The landscape today in general and the Red Rock Canyon in particular was wonderful. 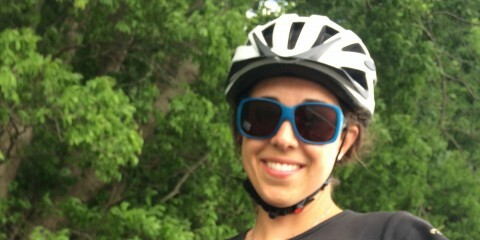 In addition, it was fantastic to cycle, as there were no mosquitos and we had a tailwind. Anyways it was a long day riding 120 km. In the evening we met a lot of cyclist going east and telling us Bear stories. At least we got a bigger bear spray! 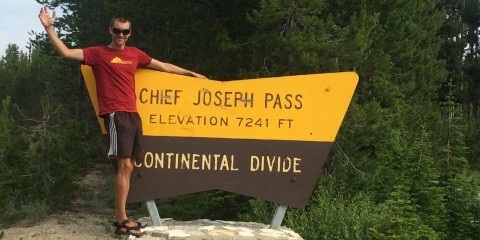 Yesterday evening we met 4 guys which are participating in the TransAm Race (http://trackleaders.com/transam15) with the same route as us but going east and having to complete it within 30 days! 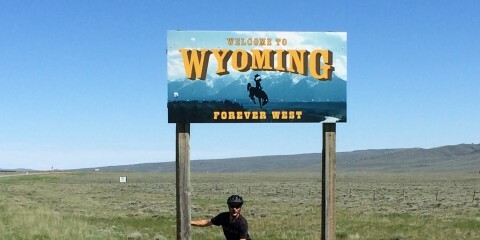 Today was a great day for riding in Wyoming especially as there was no headwind. But without wind thousands of hungry mosquitos (unlike slow stupid swiss mosquitos) waited on us and were only manageable with bug spray! However, the landscape is just amazing as we entered the area of the Red Rocks. 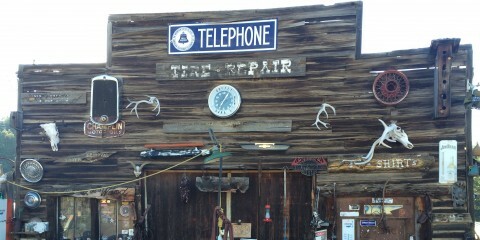 We had lunch in the abandoned village Dallas with the atmosphere of a Western. 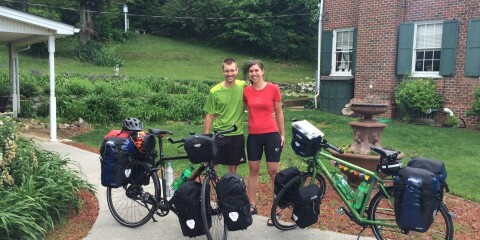 In the early afternoon we arrived in Lander, a nice little town and met two other TransAm cyclists. 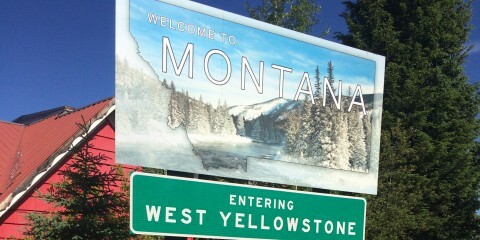 We are looking forward to the Teton National Park and are planning to stay there for several days. Today we planned for a long 130km downhill ride to Lander. We made our first stop at Split Rock which was a historic trail sign for the first half million settlers moving west over the Rockies going to Utah (Mormons), California or Oregon (Gold Rush). 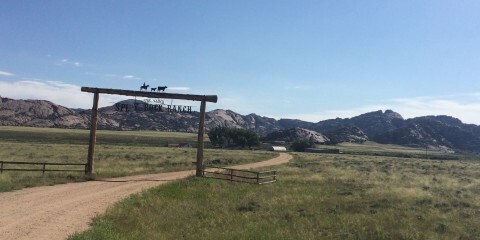 However, after riding for another hour with strong headwind and the recent experience of very few shelter places in Wyoming, we decided to stay in Jeffrey City at 11:00 after only 40km and take the rest of the day off. 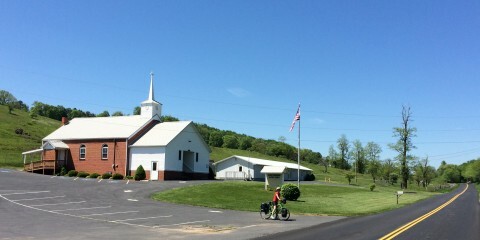 We stayed in a Church (only for TransAm Bicyclists) at Jeffrey City which has only 50 inhabitants left after the Uranium mine was closed in 1981. First 10 km we rode on a street under construction and afterwards we rode for 25 km on hard shoulder of a interstate highway where it was exceptionally allowed. 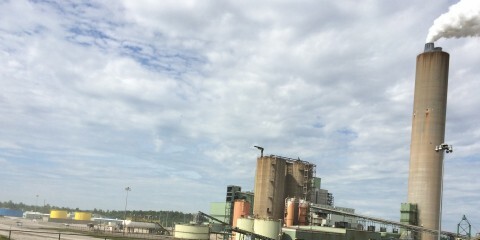 Lunch stop at Sinclair at a town created and named by the respective oil company. After lunch we had a short ride to Rawlins where we waited for the rain to pass. 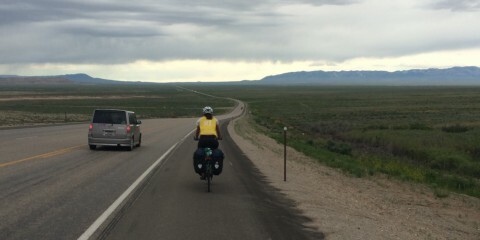 However as we crossed another continental divide (Great Divide Basin of Wyoming)* we were riding into the rain. But again we were lucky as after 6 pm and 25 km away from the next shelter Tom stopped with his Pick-up and horse trailer and rescued our Iron horses from the approaching storm. 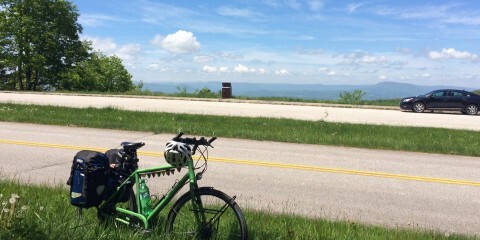 So it was an easy ride to Muddy Gap for 40 km to the nearest and only campground (without showers). Anyways we were happy to put up our tent before it started to rain. *The Great Divide Basin is an area of land in Wyoming’s Red Desert (United States) where none of the water falling as rain to the ground drains into any ocean, directly or indirectly. 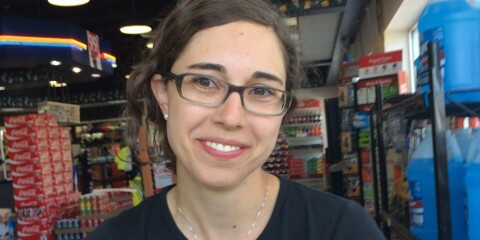 Today in the morning we had breakfast in the state park of Walden with a very nice lady from New Zealand which was older than me and Sabine together – nonetheless she is riding with a folding bicycle through the US. For us it was our last half day in Colorado, our favorite and most scenic state so far, Farewell! At lunchtime we were entering the plains of Wyoming at a altidude of 2300m with nothing else than a straight street, plains and mountains at the horizon. 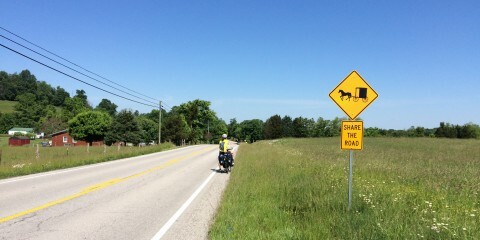 Impressive for a swiss, to slowly ride towards a always visible village around 15km away at first sight. In the evening we enjoyed a very hot bath at the public hot springs of Saratoga and stayed just next to it at a public grill place. Climbing up to Willow Creek Pass on 3000 took us the whole morning. It started to rain at lunch time and we were driving the whole afternoon close to the rain front. In addition, we saw our first moose with a calf today and its better not to stop and take a picture! 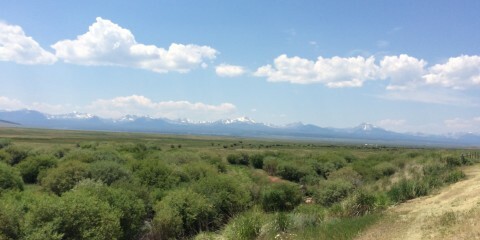 Another beautiful day in Colorado! Scenic views all day long. Lunch break at the green mountain reservoir. A short climb and a bath in the sulphur springs in the evening. Restday in Frisco. Small town with a very nice historic museum with buildings starting from the first trappers, from the time of the gold rush until now as a recreation and ski resort town. In the evening first time shopping at Whole Foods with amazing real bread in the USA! On the way home we got into a thunderstorm and got our shoes filled with water. We started at 3000 m elevation from Fairplay in the morning and climbed up to the Hoosier Pass 3515 m the highest point of our tour! Then A fantastic 10 km downhill ride to Breckenridge where I enjoyed a Bison Burger for lunch. We spent half the day in this nice little ski resort town. 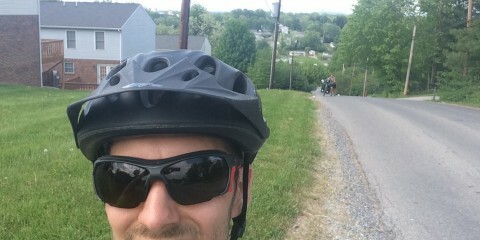 In the evening we rode on a real cycling path (Blue River Bikeway) to Frisco for a rest day. Most beautiful day of the trip so far! 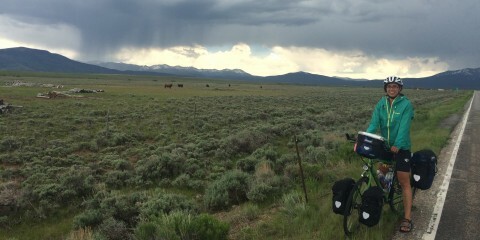 We started at 2600 and finished on 3000 m. The combination of the huge grassland with bison ranches and the white mountains as background is just wonderful! Today was a beautiful day in the rockies where we gained a lot of elevation. The roads are very nice, we enjoyed a great view on the white peaks of the mountains in the distance and all day we rode upwards on a very gentle slope. In Guffey we stayed in the tent on a personal open air museum of Bill. 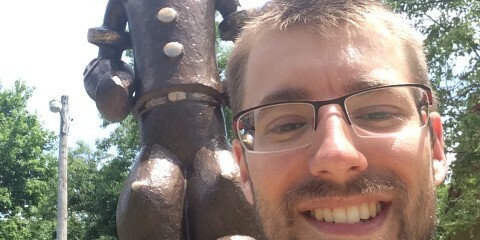 Crazy place! We shared the camp site with a dead fox, skeletons of horses, a herd of alive deer and vehicles from the last 40 years. 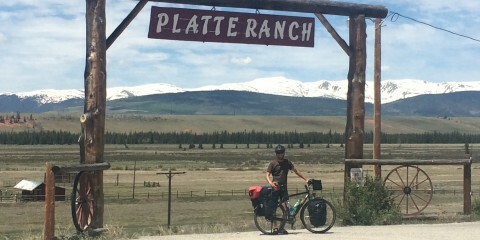 Bill was already there in 1976 when the first TransAmerica cyclist rode across the country and he is still enjoying it. Thanks for the beer! As we are already on 1500 m elevation the temperature does not rise over 30 C anymore as in the plains and it is very comfortable to ride especeially in the morning as we get up at 6 am. Today we had the first appetizer of the coming climbs even though it was the last flat day. Half the day we spent in canon city which is a beautiful small town and the royal george! 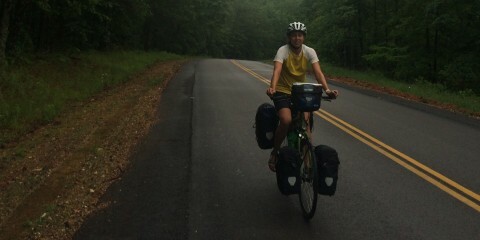 In Ordway we met Ben with the coolest bicycle bags I have seen so far on the tour! 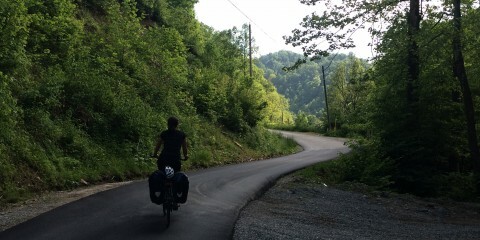 Today was the last flat day as we riding towards the mountains. 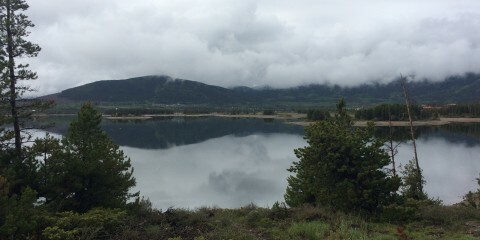 We stayed at lake pueblo at a beautiful campground with a scenic view on the lake and the rockies. 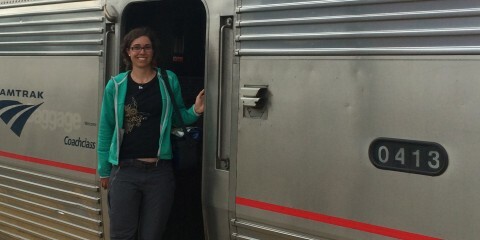 Today we took the Amtrak train from Topeka KS to La Junta CO. Due to thunderstorms the train was delayed several hours. From La Junta we rode back to the TransAmerica trail to Ordway CO where we will stay for the first time with a host from WarmShowers.org (Community for touring cyclists). Today we started riding at 4:15 am as Night Riders for 2h with the goal of Topeka 200 km away. 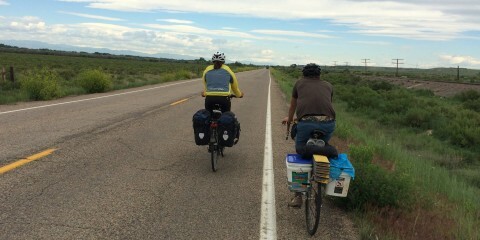 We were riding on the bicycling prairie spirit trail for 80 km and made good progress. 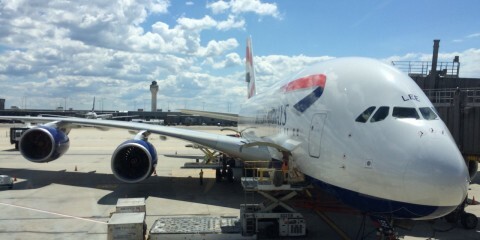 But then we had the first two stops for repair works of the whole tour so far. 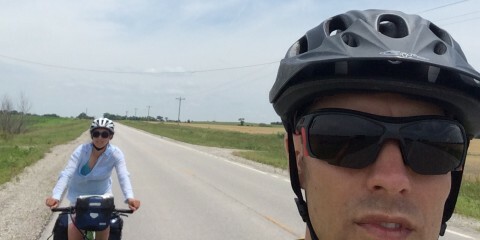 After 140 km we found out that Kansas is not flat! 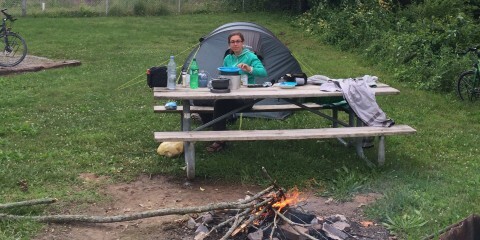 After 160 km we were so exhausted that a guy Picked us up in Overbrook and drove us 30 km to a campground where we had a shower. Now we are sitting in the Ramada lobby near the Amtrak Train station. After the thunderstorm has passed we will take the train at midnight from Topeka KS to La Junta Colorado. 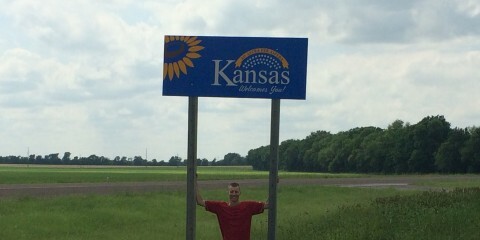 We liked Kansas much more than expected! Arrived in the great plains of Kansas. Flat grasslands with streets with no curves which we follow for up to 40 km. Temperatures are climbing up to 30 C. Tailwind from the south in the morning and evening was fantastic and inspired us to follow the wind into the north! 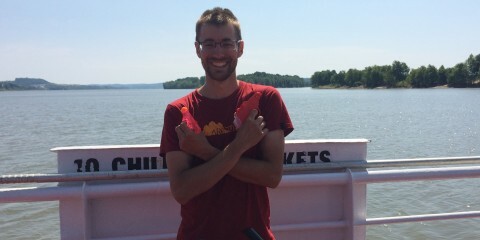 Bye bye to Missouri! Entering the great plains in Kansas. 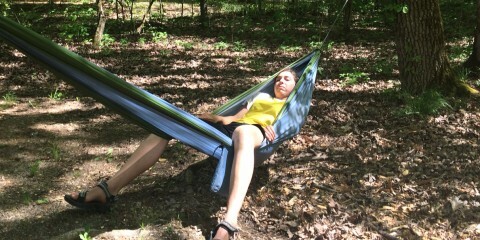 Last Day in the Ozarks of Missouri. Camping with Bryan, Lydia, Daniel and James in the city state park. 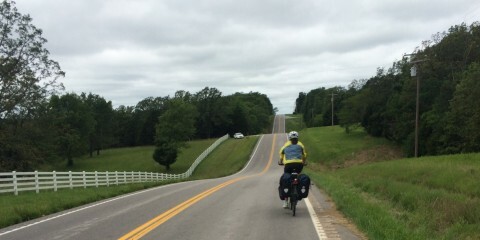 Very long day riding in the Ozark Mountains with rain, sun and headwind. Nice barbecue in bicycle hostel at farmington with James, Daniel and George. 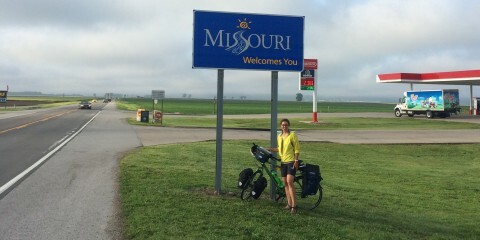 After 1900 km we are crossing the Mississipi and entering Missouri! They emerge from the underground in huge quantities only every 17 years! Cicadas, Make some Noise! 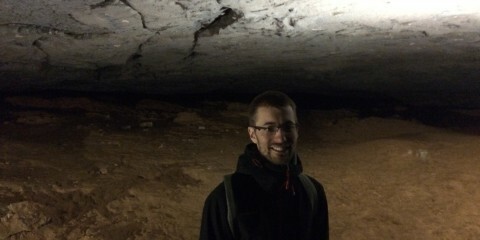 Mammoth Caves: One day underground and hiking. 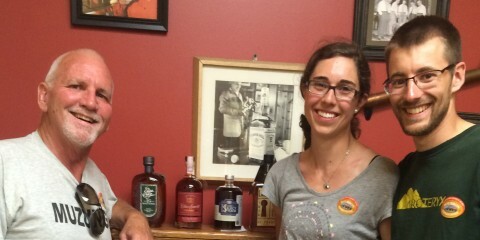 Bourbon tasting at Heaven Hill with Al in dry state Kentucky. Drink and Drive. 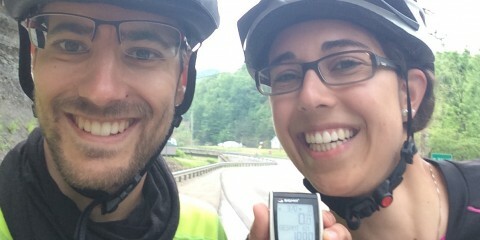 First 1000 km on TransAmerica route! 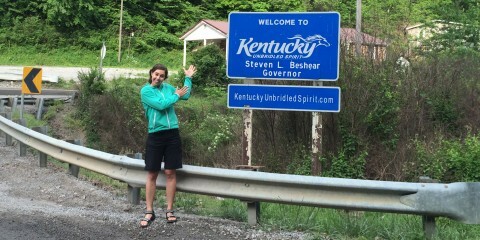 100 km we we’re chased by dogs in KY!